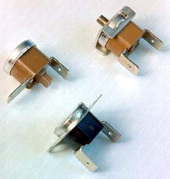 Ambient temperature rating from -40 to +240°C (-40 to +464°F). Switch actions: automatic reset (normally open and normally closed switched logic), manual reset, tripï¿½free manual reset (UL M2 class rating resists consumer tampering), one shot (meets agency requirements for single operation device). Applications: Coffee and tea makers, Gas furnaces, Sandwich makers, Fan heaters, Hair setters, Vacuum cleaners, Microwave ovens, Rice cookers, etc.